This article was submitted to Pals by one of the many individuals who feed and care for the feral cat colonies despite the bullying. When we hear comments / questions like, “this cat’s a nuisance”, here is the info you need to read. Cats were living here before we were, they naturally keep wildlife and vermin down. We have chosen to build villas and apartments so we can live on this beautiful island, that are built on their natural hunting and feeding grounds. So, we are the interlopers, not them. That being the case, we owe it to them to show compassion and live side by side. They work for us too. Cats are meticulously clean animals and, under normal circumstances, they neither seek or need our company, they only choose it. So, common comments like “they are “stealing food”, “invading our house / garden / apartment” , “pooing in our garden”, “spraying”, are very disheartening and worrying, as this is definitely NOT normal cat behaviour. If this is the very unlikely case, they must be absolutely desperate. This is because the villa / house / apartment you are living in now covers their feeding grounds and we have cut off their food supply. So, apart from being immensely cruel, “repelling them”, “moving them on”, will not work. If you move them on, others take their place. Nothing gained or achieved. Also, as is very often the case, some cats are just abandoned by people moving house, or going back. Some people even come and tell us before they do it. This is cruelest of fates as the cat has not got a clue why this has happened or what to do about it. Think differently. Think compassionately. Work with people like us, who are just managing little colonies, out of our own pockets, and our own time, on a daily basis. We feed, neuter and spey, to keep the numbers down. This is THE only way. Try donating cat biscuits, tins, now and then, or as often as you can. Or donating money for vets bills. A neutered tom, will calm down, stop fighting, and being territorial, and of course noisy, within 24 hours of being neutered. Their immune system gets a boost, and they can go on living happy, healthy lives, within a managed colony, (fed and neutered), and keeping vermin down at the time. So, it is a win win situation for all of us. Likewise spaying the females, means they no longer seek / call for males, or vice versa. They no longer have kittens when they are no more than kittens themselves. There are voluntary trap neuter return groups locally and across Cyprus, look them up on Facebook. They have the skill and the (humane), traps to help trap. Speak to your local vet and ask for charity price for the neutering / spaying. Talk to organisations like ONLY TNR, (in Peyia), AAC, or Paphiakos and ask for their help in neutering etc. 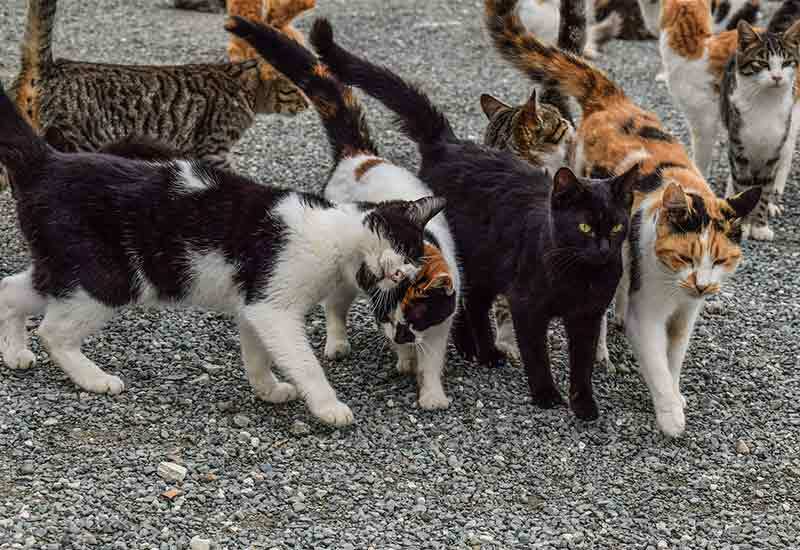 But, the key is TNR, Trap, Neuter, and Return to where they were. They will find their own domain after this. The question is not “why should I”, but, “why shouldn’t I”. I hope this helps, especially for the sake of the animals.